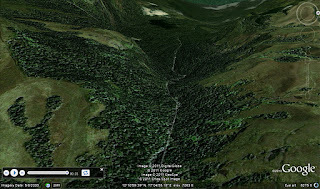 If you are a Google Earth aficionado you will empathize with my excitement of seeing satellite images of mountains and valleys in 3D and traveling through them. In spite of a slow internet connection this week in Cotonou, Benin, I was standing on top of Anamudi, the tallest peak in the Western Ghats of India. The pointer was showing north and I could see a deep gorge running east-west beyond the peak. I stepped beyond the ridge, into the gorge, turned my pointer west and flew in through the forested valley. It was like watching an IMAX movie at Prasad's in Hyderabad. I went down steps in the valley, into the midlands, and there the river widened into a reservoir. The legend on the map said Idamalayar Dam. I did a U-turn with the pointer and headed back to the mountain. On the way back I noticed the walls of this valley were far steeper than the adjacent ones. This did not look like a gully, formed due to erosion, turning into a river valley. It seemed that the Idamalayar river was flowing through a rift valley formed along a geological fault. I checked my presumption on Google, and I was right. The earth must have cracked - some day in geological past - and the same force that thrust the mountain up created a crack for the river to flow. When I was a young boy, I used to gaze at the Palghat Hills in the Western Ghats from my grandmother's house. The mountains had moods. They stood tall and cheerful on bright, sunny days, rocks reflecting sunlight and the forests taking a darker shade in contrast. They turned gloomy as they stood to hold back the monsoon clouds. I could only imagine what was beyond the ridge. There are no limits to a boy's fantasy but the human eye has limitations. Today, sitting at my desk in West Africa, I can see far beyond the ridge on my computer. My knowledge is portable - I can see it on a smartphone in any part of the world. I notice that the Palghat Hills are contiguous to the Nilgiris, where I went to study in my teens. I also understand that the ridge that I thought to be the tallest hid taller mountains behind them. The Western Ghats form a mountain chain 1,600 km in length, that runs parallel to the west coast at around 150 km distance. It runs through the states of Maharashtra, Goa, Karnataka, Tamil Nadu and Kerala, and though it has an average height of around 4,000 feet (1,200 meters), it has ridges rising above 8,000 feet. The mountains, which form the uplifted edge of the Deccan Plateau, intercept the rain-bearing monsoon clouds as they enter from the west coast into the Indian subcontinent. This leads to high precipitation along the mountains, with some regions getting between 5,000 to 7,000 mm of rainfall in a year. This has led to some of the thickest and most biodiversity-rich forests in India to be located in the stretch. The Western Ghats are home to evergreen, semi-evergreen, moist deciduous and dry deciduous forests. In addition, the mountains have the unique shola-grassland ecosystem in the upper plateau. This consists of grasslands on the hill slopes with evergreen forests of short-statured, close-canopied trees (shola forests) in the groin of the hills. The shola-grassland ecosystem ensures that the streams flowing out of the small folds in the mountains have water throughout the year. This system constitutes the ‘overhead water tanks’ for the plains of peninsular India, feeding into three major rivers – Godavari, Krishna and Cauvery – and hundreds of smaller rivers. For instance, the state of Kerala itself has 44 rivers. One of the framework conventions that emerged from the United Nations Conference on Environment and Development (more popularly known as the Rio Summit) in June 2002, the CBD recognizes biodiversity as a sovereign property, and aims to promote its conservation, sustainable use and equitable sharing of benefits. Since CBD is only a framework convention, the member countries require national policies and laws to put into effect its principles. India was one of the earliest countries to discuss and enact a legislation to protect the country's biological diversity. The Biological Diversity Act of 2002 was gazetted on 5 February 2003. Through the Act, the National Biodiversity Authority (NBA) was established in Chennai in 2003, and the establishment of similar institutions at the state and local level was recommended. The Biological Diversity Act mandates that the country's biological diversity and traditional knowledge associated with it cannot be transferred out of the country for research or commercial gain without prior approval of the NBA. Similarly, for commercial utilization within the country of biological resources or knowledge, permission has to be obtained from the relevant state biodiversity boards. The NBA or the state biodiversity boards, while giving permission can order that a part of the benefit from the commercial use of the biological resource or the knowledge has to be shared with those groups or communities that helped to preserve the resource and develop the knowledge. The Act has teeth, and contravention is punishable with imprisonment and/or monetary fine. This Act strengthens the other forest-related legislation such as the Indian Forest Act, Forest Conservation Act and the Wildlife Protection Act. As a journalist working with the Hindu Business Line newspaper, I closely followed the evolution of the Biological Diversity Act from 1997 to 2002. It was an interesting process, that had many consultations with the public in which citizen's groups, environmental activists, tribal-rights activists, foresters, bureaucrats, parliamentarians were involved. More or less at the same time there were discussions for the development of the Protection of Plant Varieties and Farmers' Rights Act of 2001. I wrote about the interface between these two Acts. The biodiversity of the Western Ghats and the ecological services that the mountains provide, however, is far greater than what can be signified by legislation. These ecological services are not only to the communities living in the hills but also to those living in the plains of peninsular India. If the rivers do not carry enough water, it can adversely impact the downstream towns and cities and thereby India’s economic growth. With new species of plants and animals still being discovered in the forests, the source of a wonder ingredient or molecule for medicine could be lost before being found. While the forests in the Western Ghats have the power to reduce climate change by absorbing carbon dioxide, the mountain ecosystem can also be seriously and adversely affected in a warming world. In the higher plateaus of the Ghats , the climate is temperate even though they stand in tropical latitudes. A warmer world would mean the loss of these temperate pockets including its unique biodiversity. Economically, this could result in loss for the plantation industry – tea, coffee, temperate vegetables and fruits, etc. – that provide livelihood to millions and export revenue to the GDP. As I zoomed out from Anamudi Peak on Google Earth and looked at the Western Ghats in their entirety, I noticed that the patches of green were fragmenting and the urban centers were expanding. Perhaps those living in the cities and towns do not realize that the mountains and forests give far more to them then what they are aware of in their day-to-day lives. [i]Myers N, Mittermeier RA, Mittermeier CG, Da Fonseca GAB and Kent J. 2000. Biodiversity hotspots for conservation priorities.Nature, 403:853–858.